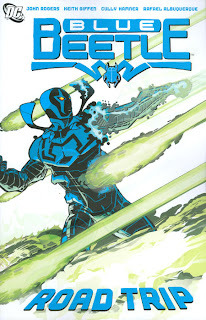 I wasn't as sold as most people on the first Blue Beetle trade, favoring the early emphasis on Jaime Reyes and his family over the later gang warfare drama. But I just read the second trade, Blue Beetle: Road Trip, and actually enjoyed it so much I finished it in one sitting, likely because the emphasis does indeed return to Jaime and his family. Blue Beetle is a fantastic teen superhero comic reminiscent of the early days of Robin, and I think it's one of the best things to come out of Infinite Crisis. Road Trip continues Jaime's quest to discover the origins of the Blue Beetle scarab; while the "road trip" itself is relatively short, the title can equally refer to the various origin theories that Jaime runs down. After learning in the last trade that the beetle scarab isn't made from magic, Jaime first tries the descendants of the first Blue Beetle, and then gets whisked to New Genesis; each offers a likely explanation for the scarab's powers, but each turns out to be a dead end. Though ultimately little is revealed about the scarab in this trade until the end, watching the theories unfold is fun, much as it was in the Damage series. What keeps this book going, despite the lack of answers within, is the rich characterization. Indeed, there's hardly much new in this trade, as Jaime fights some of the same enemies as in the first trade, but Jaime's interaction with his friends, as well as his own growing sense of what kind of hero he wants to be, makes it worth the ride. Jaime returns a certain innocence to super-heroics that's refreshing--he won't kill, for instance, because his mother taught him better--and no less, Jaime makes it cool. From his awkward interaction with the scarab armor to his banter with his friends, the Blue Beetle cast end up being characters that the reader just wants to be around. The series also plays very well with its tricky and subtle secrets. Nearly everyone in the supporting cast knows that Jaime is the Blue Beetle, alarmingly so, but not everyone knows that everyone else knows Jaime is the Blue Beetle. Jaime's friendship, and growing romance, with his friend Brenda is wonderfully hampered by the fact that Brenda's aunt is the villain La Dama, now charged by Checkmate with clipping Jaime's wings. In addition to the mystery of the scarab's origins, the Peacemaker character knows more about Jaime than he's telling, and even Paco's membership in a somewhat benign gang of meta-humans threatens to explode at any time. All of this keeps the story going despite the real lack of forward momentum. It doesn't hurt, as well, that the New Genesis aspects of Blue Beetle: Road Trip contain threads of Final Crisis, giving this trade an extra shot of continuity relevance. Indeed, DC's done well tying Blue Beetle in to Final Crisis, Countdown, Teen Titans, and the Sinestro War--I tend to think Blue Beetle could survive on its own without the life support, but every bit undoubtedly helps. Blue Beetle is a teen superhero drama much in the vein of Smallville, and with the teen superhero drama having somewhat faded in the last few years (remember the days of Anima, anyone? The Ray? ), Blue Beetle is a welcome throwback. On now to Uncle Sam and the Freedom Fighters, maybe some Atom, Ion, and who knows what to come. Thanks for reading! If you have every been over at SpaceBooger.com the Monday after a Blue Beetle issue is released I go nuts! Blue Beetle has to be my favorite monthly book. "Blue Beetle 24 is the BEST COMIC OF LAST WEEK and it tells a tale of one teenager and his phenomical supporting cast trying to ******* that plans to take over the Earth. Yeah, I know standard comic book stuff, but what makes Blue Beetle so great is the dialog, the personality of the main character, and the distinct personality of his supporting cast." I edited out the spoiler. There's a buoyancy to Blue Beetle that I think John Rogers does really well, and I was actually not displeased to hear he'd be leaving the title -- I agree with the report that he's created a nice base for Blue Beetle on which another writer could build, and I'm interested to see Rogers build his own DC career on another title.